The Munich Agreement was an agreement regarding the Sudetenland, which were areas along borders of Czechoslovakia, mainly inhabited by Czech Germans. The agreement was negotiated at a conference held in Munich, Germany among the major powers of Europe without the presence of Czechoslovakia. It was an act of appeasement. The agreement was signed in the early hours of 30 September 1938 (but dated 29 September). 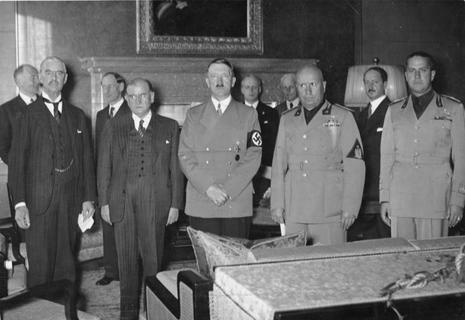 The purpose of the conference was to discuss the future of Czechoslovakia in the face of territorial demands made by German dictator Adolf Hitler. The agreement, signed by Germany, France, Britain, and Italy permitted German annexation of Czechoslovakia's Sudetenland. The Sudetenland was of immense strategic importance to Czechoslovakia, as most of its border defenses were situated there. Because the state of Czechoslovakia was not invited to the conference, the Munich Agreement is sometimes called the Munich Dictate by Czechs and Slovaks. The phrase Munich betrayal is also used because military alliances between Czechoslovakia and France were not honored. However, today the document is typically referred to simply as the Munich Agreement even in the Czech Republic and Slovakia.